Sheila Quiroga is a marketing professional who formulated strategic marketing plans, conducted marketing data analysis, and ensured implementation with the aid of her designing skills for both infrastructure and publishing companies. Sheila practices martial arts and swims in her spare time. Varun is an advertising professional with a passion for helping brands engage with audiences. Before coming to Rotman, he was with Ogilvy & Mather and GREY Bangalore for four years. Post MBA, Varun is looking to pursue a career in brand management. Max is a software engineer with solid coding, project management and customer support experience. Having worked in the enterprise software space for the past 6 years, he looks forward to developing his strategy and management skills, and his understanding of how businesses operate, at Rotman. Nikita comes to the Rotman School from Dubai, where she worked for two years in marketing and brand management for Dubai Refreshment, which bottles PepsiCo, and in public relations for Citi Bank. She's passionate about social justice and other humanitarian causes, and speaks English, Tamil and some French. Rabia comes to Rotman after two years with a Toronto-based marketing firm. She also has experience in human resources, communications and public affairs, and speaks English and Urdu. Educated in Mumbai, India, Varun is a chartered accountant with five years experience in corporate and international taxation. His goal after graduation is to become a mergers and acquisitions adviser. In his spare time, he indulges his passion for soccer and cricket. 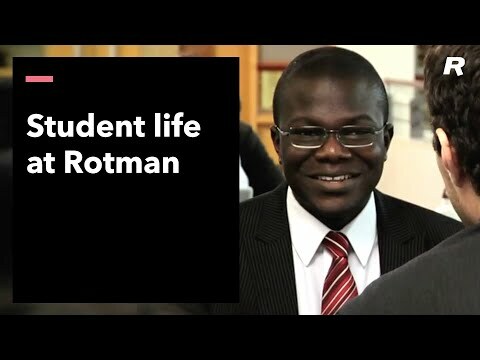 Before coming to Rotman, Ryan worked for 5 years as a project manager in retail, office, and industrial real estate. He has experience in negotiation, budgeting, capital planning, team leadership and product development, and is a skilled communicator, writer, and presenter. 2. The University of Toronto: The Rotman School is part of U of T, Canada's #1 university.